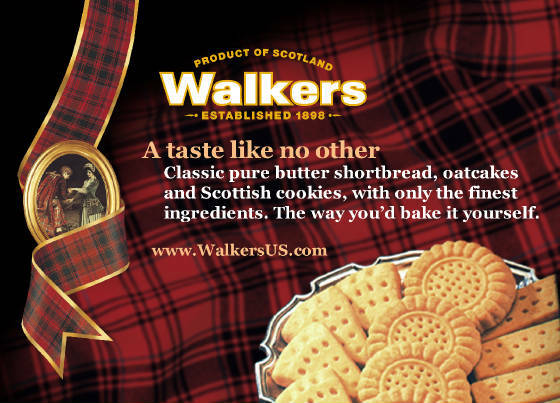 Walkers Shortbread has contributed to many of our Scottish American Society's events. We are very grateful for their continued support of our organization. On this page we will advertise special offers as we receive them, and once more to say THANK YOU for all their kind and generous gifts to us. Pack these in your child's lunchbox and they won’t want to trade with their friends! Each pack contains 2 cookies and comes in 4 varieties. Welcome your child home from school with mini versions of our all natural shortbread cookies. Our care packages are perfect to send to that college student hard at work. Comfort food is always appreciated in the dorm! Many thanks to Walkers Shortbread (www.walkersus.com) for their generous donation of a Highland Gift Basket filled with delicious shortbread for our Celtic Beltane Festival to be held at Maize Valley Farm on May 19th 2012!